I noticed this one recently on a boy who had been entered in the 2012 Bonds Baby competition, and was immediately struck by it. It has what I tend to think of as a 'Hunger Games'-esque feel about it - one part recognisable Latin, one part futuristic sci-fi. And is just generally a pretty cool name. The word Taurean (pronounced Tor-EE-an or TOR-ee-an) is most instantly recognisable as the description for someone born under the sign of Taurus. 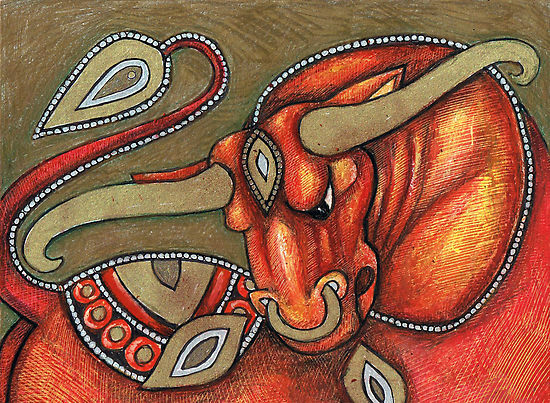 Taurus is Latin for 'bull', Taurean most likely meaning 'bull like'. The bull is also the symbol for the star sign, which is an earth sign, and falls between the (approximate) dates of May 20 - June 20. It is thought to represent the Egyptian sacred bull - which symbolised fertility and growth - and Greek God Zeus' tendency to take the form of a bull when among mortals on Earth. According to astrology Taurean signature traits are dependability, persistence, loyalty, patience and generosity - not bad traits to hope for in a child! While many will automatically associate Taurean with the star sign, fans of the shows 'Battlestar Galactica' and 'Caprica' will also recognise it as a race of people from the colony of Taura on the planet Tauron (both of which would also make pretty cool names). The Adama family is the most featured Tauron family in these shows, as William Adama is the commander of the Battlestar Galactica. For another science fiction reference, there is also a Taurean system in the 'Star Trek' world, which included a female only inhabited planet called Taurus II. Taken as a group of names, Taurus has seen consistent use for boys in the US since 1967, and if you meet any female Taurus's they were most likely born in the 70's. Taura has been much more popular for girls, never charting for boys, while Tauron has never charted in the US. Taurean however has been consistently more popular than Taurus, first appearing in the charts in 1981 for both boys and girls. Although it dropped off the girls chart within a few years, it has appeared in the boys chart every year since it entered. It's highest position was #554 in 1983. I love that Taurean is a strong, earthy sounding name, yet slightly less overt than Bear, Tiger, Wolf or the like. It could be used to honour a loved one born under this star sign, a favourite sports team with a bull as their mascot, or even someone who works on Wall Street, where the charging bull bronze sculpture is a landmark. Or if you love the idea but want something even subtler, Bewitching Names recently did a great post on Taurus inspired names. The only problem I see is that a person named Taurean would always be asked if they are a Taurus. And I can't decide if it's too cheesy for a Taurus to have this name, or if it would be stranger to have this name if Taurus wasn't your star sign. What do you think?